The sera Group is an independent family business company group with the headquarters in Immenhausen, located in the centre of Germany. Since its founding in 1945, sera has been synonymous with quality, expertise, innovation, reliability and flexibility. As one of the worldwide leading German manufacturers of dosing and compressor technology sera provides efficient and optimal customized solutions for all applications involving the accurately measured and controlled dosing, feeding and compressing of liquids and gases. sera´s core competences, dosing and compressor technology, are represented by sera ProDos and sera ComPress. Together with the sera companies in Germany (sera ProDos GmbH, sera ComPress GmbH and sera Vertriebsservice Süd GmbH), subsidiaries in Great Britain (sera ProDos UK Ltd), South Africa (sera ProDos SA (PTY) Ltd.), Spain (sera ProDos S.L.) and Austria (sera Technology Austria GmbH) and a worldwide sales and service network with more than 30 foreign representatives in over 80 countries across all continents, sera offers an optimal customer support and service locally. sera provided a solution for both challenges: the two sewage treatment plants were each supplied with a complete solution in an insulated hazardous material container with ventilation and heating. sera designed and supplied a special dosing system for the boiler plant at MVA Bonn. 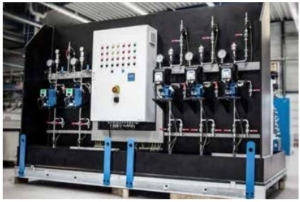 Two independent dosing systems for caustic soda and ammonia solution have been installed in this plant, which condition the boiler water in such a way that it corresponds to the specifications of the VGB guidelines for power station operation.